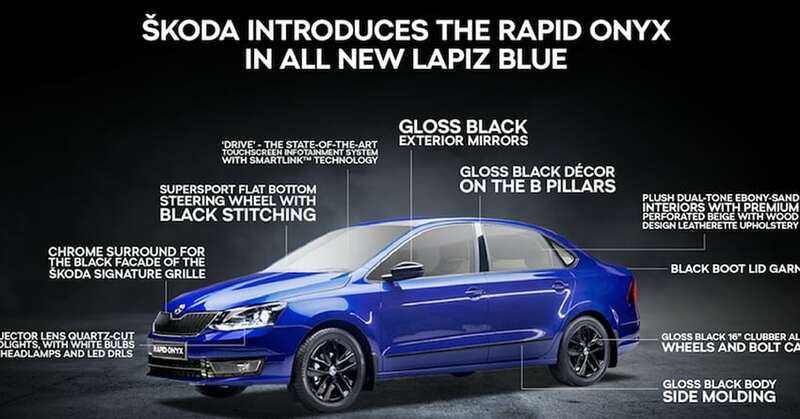 Skoda Rapid Onyx Edition is now officially available in India from INR 9.75 lakh. The base price for this model is applicable for 1.6L petrol variant with manual gearbox while same with an automatic gearbox costs INR 10.99 lakh. Buyers looking for a diesel engine can get their hands on the Onyx Edition with manual and automatic gearbox for INR 11.58 lakh and INR 12.73 lakh respectively. The shades available under this name are Blue and White, both available with 16-inch clubber alloy wheels and matching black wing mirrors as well as grille finish. The projector headlights (smoked) with LED DRLs are available as standard. Skoda offers light brown interior finish with beige leatherette seats and Smartlink enabled touchscreen infotainment system on the car. Onyx branding can be found on scuff plates of this typical variant. The rivals for Skoda Rapid remains Honda City, Hyundai Verna, Maruti Ciaz, Toyota Yaris and Volkswagen Vento. As Volkswagen group has already announced the launch of next-generation Vento and Rapid model in 2021, one can safely assume Onyx to be the smartest looking Rapid model on-road for next couple of years. The powerful engine set and tank-like built quality make Skoda a great option for Indian roads. 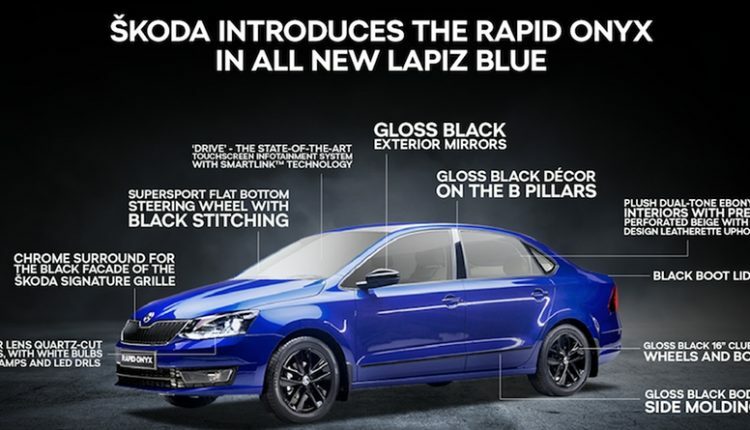 Rapid comes with a 1598cc, 4-cylinder petrol engine, producing 105PS at 5200 rpm and 153 Nm at 3750 rpm. The engine can either be had with a 5-speed manual or a 6-speed automatic gearbox. Those looking for real power will prefer the 1498cc, 4-cylinder diesel engine, producing 110PS at 4000 rpm and 250 Nm at 1500 rpm. This one also comes with the same gearbox options as the petrol engine. Not just that, diesel engine returns an astonishing 21.72 kmpl of mileage with the automatic gearbox. All models are sold with a 55-liter fuel tank and 460-liters of boot capacity.